ASTANA (Interfax-Kazakhstan) – The monitoring in the area of the mass die-off of siaga antelopes in Kostanai region revealed a steep rise in the dead animals found, the Ministry of Agriculture said. The emergency headquarters led by Deputy Akim of Kostanai region is working at the scene. The saiga antelope is listed as critically endangered, with an estimated 50,000 or so roaming the Eurasian steppe after years of unrestricted hunting following the 1991 break-up of the Soviet Union. “According to the latest update, about 10,000 saiga carcasses were found in the area of 16,000 hectares”, the Ministry said a Monday. “According to the National Veterinary Committee of Veterinary Control, the preliminary results indicate that pasteurellosis caused the death of animals”, the report says. Over 5,300 saiga carcasses have been disposed at the moment. Amangeldy district authorities declared a state of emergency. Deputy Agriculture Minister Erlan Nysanbaev said last week that experts had been collecting samples of soil, water, and the flesh of fallen animals and sending them to a state lab in the capital, Astana. He said preliminary test results were expected this week. The saiga antelope, with its distinctive big, bulging eyes and tubular snout, is listed as critically endangered, with an estimated 50,000 or so roaming the Eurasian steppe after years of unrestricted hunting following the 1991 break-up of the Soviet Union. 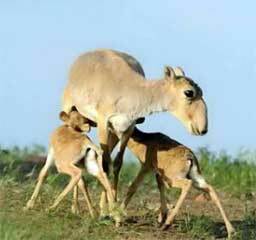 Most surviving saiga populations are found in Kazakhstan, Mongolia, and Russia’s Kalmykia Republic. There have been sizable die-offs of saiga in the past in Kazakhstan, as well as instances in which large numbers of the animals were apparently killed by poachers for their horns, which are used in traditional Tibetan and Chinese medicine and fetch around $80 a pair on the Kazakh black market. According to RFE/RL, activists blamed a May 2012 discovery of nearly 1,000 dead saiga antelope, also in the Qostanai region, on launches at the Baikonur Cosmodrome, which Russia uses for its space programs. Authorities said then that the cause was probably pasteurellosis, but that was never officially confirmed. Several Russian Proton-M rockets, which use highly toxic fuel, have exploded over Kazakhstan after being launched from Baikonur, sparking concerns among local residents and environmental activists.